Impressive results continue to roll in for Easyboot hoof boot products in endurance competitions around the world. Australia. Carol Layton and Sqiggle finished first in the lightweight division and won Best Condition at the Kiwarrak endurance ride March 21. "Many in the peanut gallery at the workout for all the division horses were heard to say that they felt that Sqiggle had the best movement of the lot," said Carol. Carol and Sqiggle used Easyboot Gloves during the event. USA. Heather Reynolds and her mare “Gem” won their 5th consecutive event with first place finishes all three days at the Cuyama Oaks Pioneer. Gem also received overall Best Condition for the event. Gem recently was 1st place and Best Condition at the Twenty Mule Team 65 and the Shine and Shine Only 50. Heather and Gem have been racing in both the Easyboot Glue-On and Easyboot Glove. “The boots have worked out really great.” said Heather. “Twenty Mule Team was a really sandy ride. We took the boots off right afterwards and there wasn’t any sand in the boots. We were really amazed.” Heather has an impressive American Endurance Ride Conference (AERC) record of over 14,000 miles. Chris Martin’s horse, Monk, finished the Twenty Mule Team Ride 4th in Easyboot Glue-On’s with Lindsay Graham of Napa, CA up. Dave Rabe finished a respectable 12th on his Arab gelding, Tigger. Vettec Adhere is used to apply Easyboot Glue-Ons. Easyboot Gloves and Glue-Ons were just released in January. EasyCare, Inc. has been a leader in the hoof boot industry for years, beginning with the invention of the Easyboot back in the early 70's. Since then, the need for boots has grown tremendously as more and more horse owners see the healthy advantages of pulling shoes and switching to natural hoof care. VVMarchMaddness TrackLogs Look Like A Horse!! 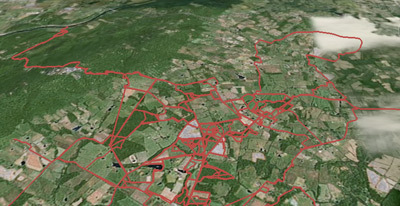 Flora Hillman's 525 Mile Very Virtual Track Logs are taking on the outline of a horse. I wonder what that might imply? 5 Days are left in the race with 5448 Total miles logged by 64 Very Virtual Riders! Benandarah endurance rider Sophie Counsell has plenty of good form on her side as she prepares for the NSW State Enduro Championships in the Boyne and Benendarah State Forests on July 19. For more local news and photos grab a copy of the Bay Post or Moruya Examiner. The 15-year-old St Peter’s Anglican College student was the fourth-placed junior rider in the pointscore for the 2008 Enduro Series and first of all the South Coast riders. She was the first placed junior rider with the best managed horse at the South Coast Championships at Nowra, where she and her horse covered 100km. Endurance rides involve minimum distances of 80km over difficult bushy terrain such as goat trails and fire trails. As her successes show, Counsell is a natural on a horse, and recently completed her three trick riding course under instructor Heath Harris, who trained riders for films such as the Man From Snowy River and Phar Lap. In this she has learnt to preform such manoeuvres such as riding while hanging under the horse. The Pony Club launched Endurance riding, as an official Pony Club discipline, on March 22nd in Milton Keynes Campbell Park courtesy of the Milton Keynes Parks Trust. The Park, along with some lovely weather, proved a perfect setting with its mix open countryside and special features; although the concrete cows proved slightly less popular with some of the equines in attendance! The competition had a full entry of over 50 competitors, with Pony Club Members taking part in four, 10, 23, 27 and 37km Endurance rides running throughout the day. The launch was kindly run and hosted by the local Whaddon Chase Pony Club Branch, who ran a seamless competition with some special touches that included a very artistic cake to celebrate both The Pony Clubs 80th Anniversary and the Endurance launch. Pony Club Endurance is generously supported by new sponsor Carr & Day & Martin and Nicola Slater, Technical Advisor for Carr & Day & Martin, was on hand throughout the day supplying riders with goody bags and the winners with some very smart polo shirts too! Cherry Michell, Chairman of The Pony Club, was delighted with the launch and commented that “Coming here today has only cemented my feeling that Endurance being a part of The Pony Club is the right decision. We have riders and ponies of all abilities, having a brilliant time and getting out in the countryside, which can only be a good thing”. It is planned that Pony Club Endurance events will be run around the country in 2009, culminating in the Pony Club Endurance Championship on September 20th at The College EC, Bedfordshire. MOSCOW, Idaho—The Appaloosa Horse Club (ApHC) Trail and Distance Department is proud to announce the 2008 recipients of the “Horse of the Year” awards. Congratulations to Fourmile’s Kuna and RR Roman Scooter. To earn the prestigious “Horse of the Year” awards for Trail and Distance, eligible ApHC-registered Appaloosas must complete a minimum of 350 miles in ApHC-approved competitive or endurance trail rides. Fourmile’s Kuna earned the 2008 Year-end High-mileage Endurance Appaloosa Award and the 2008 Year-end High-mileage Appaloosa of the Year Award. He competed in 10 competitive and endurance trail rides for a total 770 miles after earning double miles, which are awarded to “Best Condition” and “High-point” winners. The 1995 gelding also earned a 350-mile bronze medallion for 2008. Fourmile’s Kuna is proudly owned by Lisa Delp of Westminister, Md. RR Roman Scooter was honored with the 2008 Year-end High-mileage Competitive Trail Ride Appaloosa Award. The 2001 stallion earned the award by competing in 15 competitive trail rides, and completed 495 miles. He also earned a 350-mile bronze medallion and the 2008 1,000-mile award, which is awarded to an Appaloosa for each 1,000 miles that it completes. RR Roman Scooter is proudly owned by Barbara Gardner of Oakfield, Wis. These awards will be presented to the Appaloosas’ owners at the 2008 Year-end Open/Non-pro Banquet held in conjunction with the 62nd National Appaloosa Show/2009 World Championship Appaloosa Youth Show in Jackson, Miss., June 22-July 4, 2009. To learn more about the ApHC Trail and Distance Program, please call (208) 882-5578 ext. 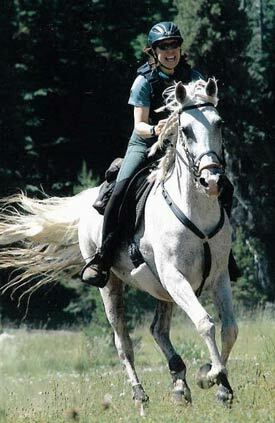 221; trailrides@appaloosa.com or visit http://www.appaloosa.com. The Appaloosa Horse Club (ApHC) was established in 1938, with a mission of preserving, promoting and enhancing the Appaloosa breed. The ApHC has since registered more than 670,000 Appaloosas, which are known for their distinctive color, intelligence and even temperament. True to their reputation as an extremely versatile breed, Appaloosas can be found in nearly every discipline including racing, endurance riding and serving as reliable family horses. The International breed registry is headquartered in Moscow, Idaho, the heart of the Palouse region—the Appaloosa breed’s namesake and point of origin. A new breeding promotion for the Shagya Arabian horse breed in the US is aiming to increase awareness in the breed. The American Shagya Arabian Verband is giving owners the chance to breed their mares for a stud fee of $200. There are only about 150 of the breed in the US, and 1500 in the world. A famous descendent of the Shagya is the "stallion of the century", Ramzes, who was by a thoroughbred sire and from a Shagya mare. He began the "R" line prominent in dressage and grand prix jumping family lines. ASAV has a registry book that records the Anglo-Shagya cross. The Arabian-based Shagya breed has been around for more then 200 years, with a certain type being bred for and ruthless culling to set its traits. Breeders say the Shagya's temperament and mind are second to none. In Europe Shagya blood it is highly prized, and many Shagya stallions can be found in the warmblood studbooks. It is one of the recognised breeds used in Trakehner breeding. "They can add refinement without loss of bone and substance and superior horses in the first generation. They are not supposed to resemble purebred Arabians, although nothing, but Arabian, is allowed in the studbook. Instead the old horse masters selected for superior riding qualities and temperament," the ASAV says. "The modified Baroque conformation crosses well with all breeds and improves hip and shouder angles, legs and feet and a soft back that is easy to sit. Typically one can expect taller foals with more bone and substance." The goal of an ideal cavalry horse was the orginal purpose for the breed's existence. This has been accomplished and resulted in a potent and desirable animal. The breed has been discovered by the endurance people and many purebreds and cross-breds are competing at the FEI level and have won international races. One cross that is producing division winners in the hunter ring is the Shagya stallion crossed with Thoroughbred mares. The foals are tall, with improved conformation, better feet and legs, and all of the flight reaction of the Throughbred is replaced with a lovely prospect, perfect for jumping, combined training and many other disciplines. Riding on Dartmoor, particularly the colder northern side, can often be a daunting prospect, especially at the end of February. Despite a thick mist and chilly drizzle 30 endurance riders set off from Okehampton camp for a 14 mile training ride. Due to the fog they had to ride from marker flag to marker flag. Fortunately for the horses and their riders, the cloud began to lift as they rode down the steep hill to Meldon reservoir and by the time they had dismounted to cross the dam on foot and were heading along the bridleway towards Sourton Down, the visibility improved. By the time, the last riders had reached Higher Nodden, the last of the cloud had lifted. Despite the conditions, all the riders competed the 14 mile route, including several new members. One of these was Val Jones from Feniton, near Honiton, riding her ex-racehorse mare, Flying Artist pictured below. The first competitive endurance ride of the season in the south west will be the Wadebridge Ride on Sunday, March 22, which includes a 20 mile Pleasure Ride. Allah reached up, blew in his hand and out came the Arabian horse, his gift to the faithful: "Drinkers of the Wind, Swallowers of the Earth, Light as a Feather Blowing Across the Land." So the legend goes. Robert Bouttier, known by his friend and neighbors as "Archie," a buff, wind-burned, enthusiastic man who loves to ski as much as ride, breeds these legendary horses, races them on the track and rides them in endurance contests all across the West. Many of his horses have won national honors. They include French Kiss, Colorado Race Horse of the Year, and Zabkin, National Endurance Point Champion, who logged over 1,400 miles in one year and won several 100-mile races. At last count Archie had 57 Arabians on his 85-acre ranch, called Drinkers of the Wind, on Broadford Road in Bellevue, along with three dogs and four cats. Archie is a romantic, at least as far as animals are concerned. He still has his old polo pony, Rose Real Matuse, now 35, which he used to ride at the Broadford Polo Club, which he co-founded after moving to the Wood River Valley in 1973. And he still has his old white Pyrenees, Big Molly, which he got to protect his cats from predators. "I had a white cat at the time and I'd look out the window and see that cat trying to stalk mice with the big dog right behind her just doing his job, but scaring all the mice off," he laughs. "She was really annoyed. All my dogs and cats get along, though—they're old pals." Archie was raised in Manhattan Beach, Calif. His father, who was in flight training at the time, died of spinal meningitis four days before Archie was born in the waning days of World War II. His grandfather, a cowboy from Colorado, worked at Paramount Studios in Hollywood. Archie graduated from Long Beach State, eventually became a pilot and, at age 26, went to work for United Airlines as a flight engineer. "I had nightmares about going to work in an office, so when a friend of mine painted this wonderful picture of making a quarter million a year flying with lots of time off, I went for it." Although he worked his way up to senior co-pilot on international runs before he retired early in 2003, he was furloughed along with 500 others during the recession of 1971. It was at that time that he moved to the Wood River Valley, started to buy property on Broadford Road and got his first Arabian. There are a variety of Arabian horses, and he breeds and raises Polish Arabians, descendents of Polish cavalry horses that were the finest in Europe for 200 years. "You know, most people think of Arabians now as expensive show horses, but that's an unfair categorization. They're really a great all-around horse, and although they have sturdy feet and a heart as big as a thoroughbred, they have less body weight so, like the legend says, 'they move light across the ground.'" Polish Arabians, Archie explains, also have a wonderful temperament. They're easy to get along with; they're not high strung. They are also very athletic. He races them on the California Fair Circuit and in Colorado. Horse racing is generally in decline, he explains, but endurance riding, in which a horse might run 25 miles a day in the novice class and up to 100 miles as a veteran, is growing in popularity. This combination of track racing and endurance riding gives Archie a way to live by an ethic he has about all animals: You don't abandon them if things don't work out. "Look, over 90 percent of thoroughbreds that are bred to race never make it to the track. Most of those that don't make it are just discarded. I'm not going to do that. "If I have a horse that likes to run on the track, that's where I take them. And if they get tired of it or just don't take to it, we go on the endurance circuit. Then either way, I've got a stable of great horses." In the West, there's still a good market for a well-trained family horse, he notes, and he's got plenty of those. But he also sells his Arabians all over the world. "I recently sold an endurance champion to a buyer in the Middle East, so one of my 'Drinkers of the Wind' went back to where it all began. Isn't that something?" Unlike many horse breeders, Archie is a one-man show. He gets help when he needs it, but for the most part grows his own hay, builds his own fences and foals his own colts. He has foaling stalls where he can sleep on a raised platform next to the mares that are about to give birth. "That way I'll always be there when they need me," he explains. Robert Boullier is there for all his horses, whether they're young, old or sick, get hurt or just didn't work out as champions. "I feel about horses the same way I feel about dogs and cats. It doesn't matter what color they are or whether they're big or small or pretty or ugly—they're all great to have around as far as I'm concerned." Dream Weaver was my first real horse and we had a lot of special times together. First horses are always special, aren’t they? For the last few years Weaver has been living in South Dakota with Barney and Linda Fleming, getting to be a horse and enjoying the good life – no real work, just play. I was so happy last year that I got to go to South Dakota and visit and ride Weaver for a few days. We had a great time and he was just as he always was – you could get on him and expect him to behave like a good boy. I was so looking forward to going and visiting with Weaver and getting to ride him at the upcoming endurance clinic that Barney is putting on in a few weeks. But, it wasn’t to be. I knew when Barney called that something was wrong. He said that Weaver had not come in to feed at 5:30 a.m. that morning. Weaver was looking good at dinner the evening before. Barney found Weaver passed on with no signs of a struggle or anything wrong and nothing was broken so it appeared that he had a quick and painless death. Weaver would have been 19 in a couple more weeks. Barney said that he buried Weaver with an XP shirt. I’m sure he knows what that was and is somewhere galloping and kicking up his heals going down a historic trail in heaven, stopping of course to eat as that was his second favorite thing in the world to do! dream_weaver_endurance_horse Farewell to my beautiful chestnut gelding, Dream WeaverI got Weaver when he was three years old, a beautiful chestnut (mostly CMK breeding) gelding for $500. He was unbroken and had grown up living in a pasture with a herd of horses. He was such a sweet natured and uncomplicated horse that I had no trouble at all training him. We did everything together and even as a four and five year old he had the maturity of a horse several years older. I could trust him in any situation. We chased cattle, we went to playdays and I showed him.